The Gift of Womanhood offers every woman a profound formula and transformational techniques for liberating her psyche, and reveals a groundbreaking approach to women’s empowerment. Guru Rattana decodes your mysterious design and guides you to awaken to your authentic identity as a sacred woman. 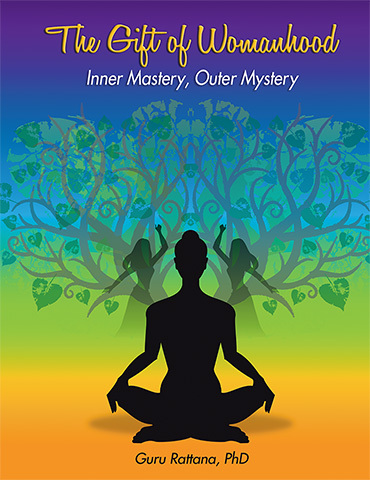 With deep insight and sensitivity, she illuminates a unique spiritual path for women using Kundalini Yoga and Meditation techniques that will touch your soul. Includes 31 Kundalini Yoga sets and 25 meditations, all fully illustrated and specifically chosen to create physical and emotional balance and internal harmony. Though the book is written for women, there is so much knowledge and insight about human nature, the psyche, and the path of spiritual growth and empowerment that any man will benefit a great deal as well. I feel so privileged and touched to read about the true identity and potential of all women. Guru Rattana, Ph.D., author, teacher and teacher of teachers, has been a student of Yogi Bhajan and teacher of his Kundalini Yoga and Meditation for almost 40 years. She literally lives and loves Kundalini Yoga, and has devoted a large part of her life to teaching and writing books about this amazing technology.